The back story to this recipe is that I met an editor of VegNews at the BlogHer Food conference. We got to talking and she told me November was National Vegan Month. I was inspired to develop several vegan recipes to celebrate the month and to help me reduce the animal fats in my own diet. This Asian-inspired stuffed cabbage is stuffed with a veggie-packed stir-fried rice and features a zippy sesame soy sauce. (Use a wheat free soy or tamari sauce to make it gluten free.) The recipe was developed for my twice-a-month food column at the j. You can see the complete article here. What is this Asian-ish dish doing in a Jewish newsweekly? Well, my wonderful editors really give me free reign on what I choose to write, but stuffed cabbages of all sorts are traditional Eastern European dishes. (Plus other Jewish communities stuff cabbage and grape leaves as well as vegetables with all kinds of rice pilafs and mixtures.) And there are Jewish communities throughout Central Asia and the East, where traditional dishes have been adapted to local ingredients, so just think of it as a Far East Eastern European speciality! First prep the cabbage leaves. Score the bottom of the cabbage all the way around stem with a knife to detach the leaves from the stem. Pull off 10 of the outer leaves, making additional cuts at the stem if needed. Place the leaves in boiling water in a large pot. (You may want to prepare a few additional leaves in case of rips and tears or if you have some leftover stuffing.) Cover and simmer for four to five minutes or until tender and pliable. Drain and let cool. Preheat oven to 350 degrees. Grease 9x12-inch baking pan with oil. In a wok or large frying pan, heat 2 Tbs. oil over high heat. Add onions, stir fry 1 minute. Add in garlic, ginger and red pepper flakes, stir fry for a minute. Add jicama, red bell pepper and carrots. Stir fry 3 minutes. Add mushrooms, stir fry 2 minutes. Add the cabbage. Stir fry 1 minute. Add the green onions, salt and wine and mix well. Add cold rice, mix well and stir fry for 2 minutes, breaking up any clumps. Take off the heat. Stir in ¼ cup cilantro. Spread a cabbage leaf on a cutting board. Cut off hard end of stem. Place ¼ cup of filling in the middle of the leaf. Fold over the two shorter sides of the leaf over the filling. Fold over one of the longer sides, then the other. Place folded side down in the prepared baking pan. Repeat with other leaves until you have 10 stuffed rolls. Bake, covered with foil, for about 30 minutes or until the rolls are heated through. While the rolls heat, mix 2 Tbs. vegetable oil with the soy sauce, chili paste, vinegar, sugar and sesame oil in a bowl. Mix well. Stir again and drizzle half over the cabbage rolls and garnish with cilantro before serving. Pass remaining sauce on the side. 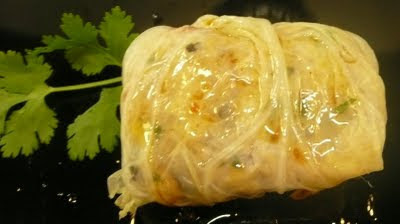 Update: I've posted a second vegan cabbage roll recipe -- Eastern European style with a sweet and sour tomato sauce. You can check it out here. Oh wholly yum! Looks so good! Congrats on your mention at FFF! I love cabbage rolls and yours look delicious. I am hosting a traditional Serbian Christmas dinner this week. However on the guest list I have friends who are vegans. Luckily I found this recipe, otherwise my frineds would not have anything to eat. I beleive that I too will be eating this rather than the traditional Sarma. Thank You!